It happens every day: proposals are made by businesses and accepted by prospects. No one ever said it would be easy, but your company can be on the winning side of that equation by mastering the five skills needed to create great proposals that win bids. It’s not a magic trick that others have mastered better than you have. It’s a constant work on your skills. There is not a magic button that can be pressed, and all your proposals will automatically win every time. The proposal starts with thorough planning, moves to great conception, and hinges on execution and follow-through. For a proposal to win, all those factors must congeal into excellence. While on the surface this may all sound like a daunting prospect, there are some great practices that you can adopt to make the most of each and every proposal your business issues. The truth is, the various must-haves involved in the proposal submission process call for you and your team to conquer certain skills. Every step in the proposal-generation process can be linked to one or more individuals inside your organization mastering some key skills. 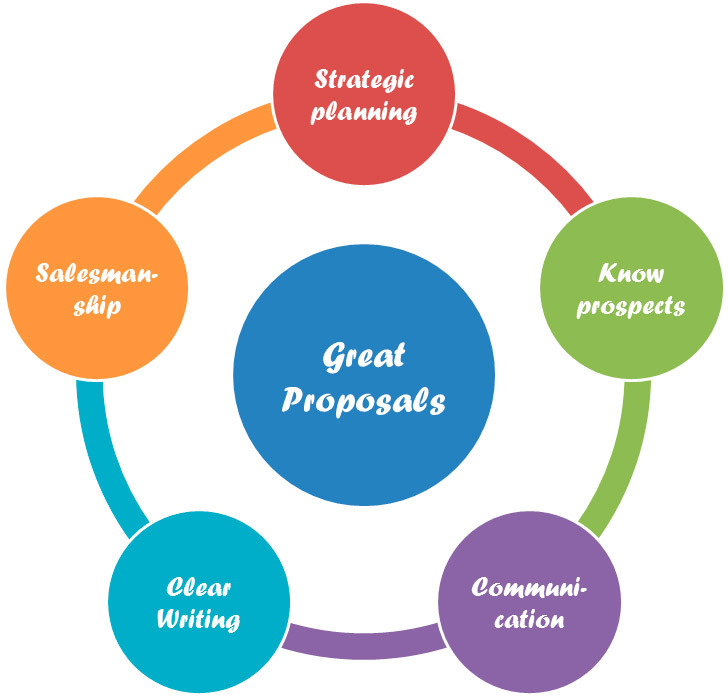 Let’s take a deeper look at five skills needed to create great proposals. It has been said that the best way to fail at business is to operate without a plan. This is very true when it comes to creating proposals. The fact is, your proposal strategy is the most important step of all. But proposal strategy requires expert managerial skills, as you’ll have to understand your business and its prospective customers, your abilities to deliver on the customer’s needs, and any market challenges that your business faces. This means that you or a designee must be put in the Proposal Manager role in order to hold your team of researchers and writers in creating the proposal accountable. As you may know from other aspects of your business, the better the planning you put in, the greater the results will be. One of the biggest – and most detrimental – mistakes you could make is to misgauge the needs of your prospective clients. Information in the proposal that does not meet with your prospect’s needs does nothing to win the bid. For this reason, your team must manifest great research skills in order to know as much as possible about the prospective company before the proposal creation ever starts. If the language or your proposals is significantly disjointed from what your prospect needs, the whole effort is a loss. A healthy dollop of business reconnaissance will go a long way toward helping you secure a winning bid. As such, your team simply must have someone who specializes in getting to know your prospects and their needs. Every aspect of a given proposal must hit on points that are relevant to the prospective business. So the next skill needed to create great proposals is effective communication. And we’re not just talking about writing here; the need for effective communication carries-over into managing your proposal team and developing the fundamental concept of the proposal. Every person on your team needs to be clear on what your proposal is intended to convey to its recipient. Failure in this skill area can result in offering the wrong solution, or making excessive claims. Everyone involved in the proposal creation process needs to be on the page, and achieving that comes down to effective communication throughout your organization. Of course, the proposal must also be effectively written and clear in purpose. It must sufficiently address the problems faced by your potential clients, as well as offer them a clear solution. Communication is a skill that you cannot afford to miss! Closely related to the skill of effective communication is that of clear and concise writing. The problem is that all too often, people tend to think of creating proposals as simply being a writing exercise. Planning, conception, management, and delivery are all equally as important as writing. Nevertheless, the writing itself does matter. The copy in your proposal should (of course) be grammatically correct, in a consistent font and style, and legible in every regard. Beyond those general writing skills, though, a successful business proposal should speak to the modern audience in the digital age. Wordiness, big paragraphs, and academic language just won’t do. In fact, research has shown that those things are repellant. This is not to say that your proposals should be conversational in tone, though that may be appropriate in certain situations. More to the point, your proposals should be concise and should focus on communicating the message you need to send to your prospects. Whatever wording you use, it should be sufficient for the industry you operate in, never over-the-top, never overly simplified. A proposal covers the traditional sales process, even if it is not as obvious as in other arenas. A proposal without an actionable ending that asks for prospect buy-in is really just a piece of informational literature. By ensuring that your proposal appropriately incorporates a sales element, you’ll ensure that your prospective customers are clear on how they can accept your proposal. Do you get the impression that all of these five concepts are closely related? That’s because they are! The sales aspect of your proposals should communicate your unique advantage effectively, with verbal concision. Excessive, overbearing claims and being advertorial will work against you, so it’s important to anchor your proposal’s selling elements with factual information and tangible benefits for your prospects.